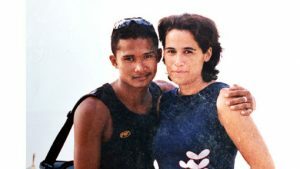 The history of Rawai Muay Thai starts with an unlikely love story between a professional Thai boxer and a foreign traveler. Tuk and Diana met by chance, on a boat trip to the Similan Islands, back in 2003. Diana was travelling around Thailand and Tuk was back home after years of fighting in Thailand. They fell in love and married the same year. The gym was the result of their collaboration. Tuk brought all his Thai boxing expertise. Diana brought her love of adventure, language expertise and resourcefulness to the partnership. Twenty years ago, there were few Muay Thai gyms in Phuket. For example, Singpatong and Suwit gyms were well established in Phuket but only trained Thai fighters. They did not teach women or foreigners back then. So as a tourist, if you were interested in learning Muay Thai in Phuket, you were out of luck. Tuk and Diana opened Rawai Muay Thai in 2003 realizing that there was an opportunity here to fill the gap in the Muay Thai scene. Tuk was more than happy to teach anyone who showed interest. He had his Thai fighters who lived in the gym but pretty soon, tourists began to show up and ask to train as well. In a short time the gym filled up with people from all over the world. As the popularity of Muay Thai increased, more and more gyms began to open around the island. Many gyms in Phuket have ties to Rawai Muay Thai, since we were one of the first gyms on the island. For example, the original owners of Tiger Muay Thai, Will and Sean, used to train at our gym regularly. The owner of Sinbi Muay Thai was our trainer for a few years. Diana quickly noticed that only men were doing Muay Thai. You have to remember that back then women, both Thai or foreigners, did not fight in Thailand. They were not allowed to fight in the stadiums. So trainers were not inclined to teach women because they considered it a bit of a waste of their time. The whole point of doing Muay Thai in this country is to be able to fight professionally. So trainers focused on teaching boys. “Women just did not do Muay Thai back then”. Tuk, however, had a vision of opening up the sport to everyone, not only men and not only Thais. Rawai Muay Thai made a conscious effort to welcome female students to the camp. The gym was a front runner in this effort to teach and promote women to the sport. So he welcomed women in his gym. At first it was a learning curve. His trainers were not sure how to teach women, especially during clinching and sparring. The trainers were also reluctant to let women train in the ring, so they were limited to learning on the concrete floor. All of that soon changed as Diana pointed out the unfairness of the situation. So women in our gym began to get the same treatment as men and the word quickly spread. We became known as a gym friendly to women interested in doing Thai Boxing. It happened quickly though and pretty soon, women were fighting in stadiums, on TV, all over the country. But there is still a way to go. The most prestigious stadiums in Thailand still do not allow women to fight. To this day, fighting in Lumpini and Rajadamnern Stadiums remains a possibility for male fighters only. So there is still work to be done in this area. Phuket had only one Muay Thai stadium back then, Sappan Hin Stadium, which no longer exists. We would take our boxers to fight there and to fairs outside of Phuket. With the growth of Muay Thai there cam a need to have more places to hold fights. Bangla Stadium was the first stadium built in Patong. It was on Bangla Street, the famous pedestrian tourist destination. It has since changed location and is now next to Jungceylon Mall ad holds fights every Wednesday, Friday and Sunday. The other big stadium in Patong is Patong Boxing Stadium on Sai Nam Yem Road which holds fights every Monday, Thursday and Saturday. December 26, 2004 is a date everyone in Thailand will remember. The gym had been open for little over 1 year and we had gone to Phi Phi Island because our trainers Tuk and his brother Hehm were going to fight threre. We returned to Phuket on December 24th but some of the trainers and students stayed in Phi Phi to enjoy the holiday. Two days later the Tsunami devastated the region. Our trainers and students were unable to return to Phuket for a few days. It was a scary time, but thankfully, all of our students and trainers were alright. Rawai Muay Thai also changed the whole concept of the Thai gym. Back then gyms where small, with few facilities. We had the idea to transform the gym into a comprehensive living experience. So we built bungalows, and added western toilets and hot water showers. We offered meal plans to our guests and offered a full day of training and activities. Our guests had the chance to live with the Thais and experience the Muay Thai lifestyle, from daily training and eating together, to going to the fights and cheering for our boxers. The concept of transforming the gym into a camp revolutionized the Muay Thai industry and it is the format that most gyms follow nowadays. If you wanted to open a Muay Thai gym in Thailand, these were the years to do it. The increasing popularity of UFC around the world, and of martial arts movies like On Bak helped to propel the growth of Muay Thai tourism in Thailand. More gyms started to pop up all around Phuket. The increase in demand for training centers spurred some of our students and trainers to venture their own ways, opening gyms like Tiger Muay Thai, Sinbi Muay Thai and Asia Muay Thai. Phuket was booming. Phuket quickly built stadiums to fill the demand for watching live fights. In Patong there are two stadiums, Bangla and Sai Nam Yen, where you can see live fights. In Chalong fights promotions are available in Chalong Stadium, Republic Stadium, Chokchai Stadium and Suwit Stadium. For a small island, Phuket became the Muay Thai mecca and Rawai was a pioneer. 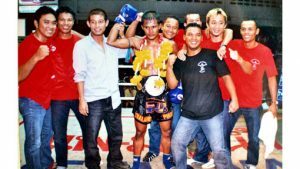 Over the years Rawai grew to become one of the premiere Muay Thai gyms in the country. Students from all over the world would come to train with us. We also developed aspiring young Thai boxers who want to become champions. Our fighters boxed in Bangkok’s most prestigious stadiums, Lumpini and Rajadamnern, and in big promotions like Thai Fight and the King’s Cup. Our boxers have also competed abroad, in China, Australia and Malaysia. We are proud of our students who have won numerous stadium titles as well as the World Muay Thai Council (WMC) and the World Professional Muay Thai Federation (WPMF) titles. Muay Thai has given Tuk and his family everything they have. With success comes responsibility. Tuk wants to give back to the community, giving young boxers the opportunity he was given. His goal with every fighter is to make them the best that they can be. Every guest who comes to learn at Rawai is helping us to achieve this. We have established a Kid’s Fund and a percentage of your training fee goes to this fund, to help support local fighters in the pursuit of becoming champions and having a better life. At Rawai we stress the importance of fitness and good technique. Our teaching style follows the traditional methods passed on from generation to generation. The way Muay Thai has been taught for decades, the way Tuk and his brothers learned growing up. After 10 exciting years in Phuket we decided it was time for a change. We chose to move to the quieter town of Khao Lak. In our opinion Phuket has grown too much and is no longer the best location for training purposes. There are too many distractions in Phuket (night clubs, bars, malls, traffic). If you really want to focus on your training and get the results you want, then Khao Lak is a better location. It is a quiet seaside town, not yet developed much, perfect for enjoying the sea and nature. For a more personal narrative of the gym’s history you can read the article “Rawai Muay Thai Built on a Foundation of Love” in Internationality.